One innovation driven by social media is the tag cloud. Tag clouds allow users to see common repeated terms in a list of content. 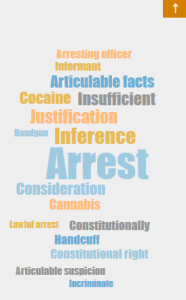 For legal research, this can be invaluable for focusing your search. Say you’ve run a search for “Terry Stop,” but the number of returned results is too large and you would like to focus the search to more precisely meet your fact situation. The tag cloud that automatically loads on the bottom left side of your screen is a perfect solution. Simply click on a term to have it automatically added as a filter to your search. So now your search for “Terry Stop” and Arrest is narrower and more precise, all with just one click of your mouse.